Well, I guess I'm technically on spring break - though the fun times of photography never take a vacation! I am very pleased to say that I am not in school this week....though that has not stopped the homework from having to be done. I also have a couple of portrait sessions this week and I really enjoy them, so I'm happy about it. 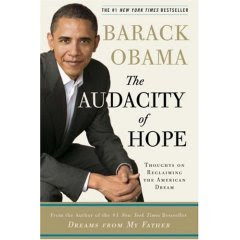 Now, I'm not trying to turn this into anything political at all, so please don't be mad, but I wanted to share that I'm reading Barack Obama's book, "The Audacity of Hope" right now and I'm really enjoying it. First of all, it's a major page-turner and I cannot put it down. :) I think that no matter what your political views are, it can be beneficial to see what the people in power have to say and to get an idea of what everyone thinks. I'm usually not that in to political books, but I have to honestly say that I find Obama's ideas very refreshing and his writing style enjoyable. Anyway, that's what I'm up to. Hope you all are having a wonderful spring break! more like "the audacity of ikea!" geez!